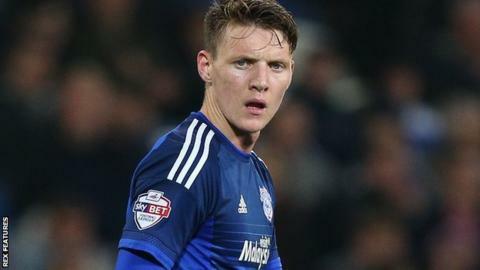 Cardiff City striker Joe Mason believes he can build an effective partnership with fellow forward Tony Watt. The Bluebirds are understood to be confident of securing a permanent deal for Watt, who is on loan from Charlton. And Mason - who scored the only goal in Saturday's 1-0 home win over Blackburn - wants the 22-year-old former Celtic and Standard Liege striker to stay. "I won't lie, I didn't know too much about him. He took me by surprise a bit, how well he has done," Mason said. "We are quite similar. He's a better ball carrier than I am - I'm more [about] getting into space and turns. "There's no reason why we can't play together. We just need to, as a team, work out how to get the best out of us." The pair combined up front on Saturday after Kenwyne Jones was dropped, with manager Russell Slade revealing that Jones is in talks with a foreign club. It was Mason's first start since 21 November and the club's new top scorer believes he is a better player for his time out of the first team. "Obviously its frustrating being out the team but I can see why I was. I wasn't playing well enough at the time," Mason added. "It's given me a chance to take a step back and really try and win my place again." Cardiff winger Anthony Pilkington said after Tuesday's draw with Nottingham Forest that the state of the club's home pitch was contributing to "sloppy play". And Mason echoed those sentiments. "The pitch is awful," he said. "It's terrible. It's a shame really because we're the sort of team that like to get the ball down and pass. It's restricting us a little bit. "I don't think it's stopped us too much but it's not the greatest at all." The ninth-placed Bluebirds host League One Shrewsbury in the FA Cup on Sunday 10 December before consecutive Championship away games at Hull and Wolves.